Anil Balgobind is one of the leaders of innovation on the Dutch govtech, social, urban and technology scenes. His team is helping Amsterdam transform in lean startup way of thinking and doing. Anil has hands-on, exclusive experience of designing and implementing the innovation in the city of Amsterdam. Apart from that Anil was the Director of Digital Transformation of Schiphol Airport, setting the foundation for one of the best, most effective and innovative airports of the world. Frans-Anton Vermast is an expert in searching for opportunities for novel appliances and services that make cities and their regions an inclusive society and a more habitable place for people to live, work and play in pleasantly. 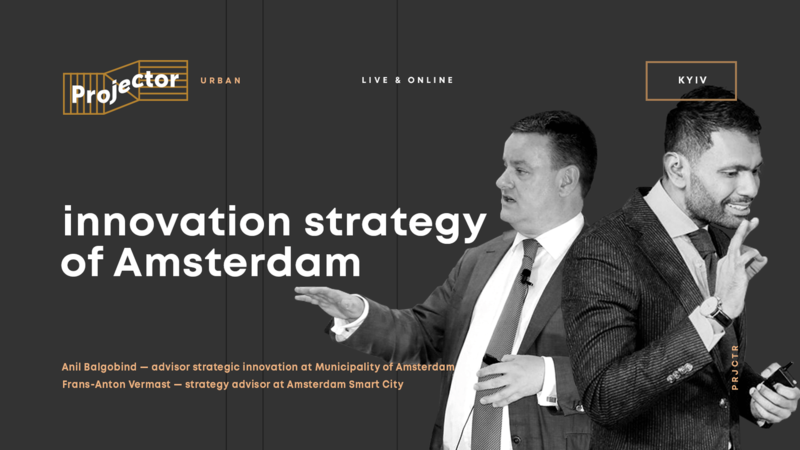 Since 2008 Frans-Anton Vermast has been Strategy Advisor and International Smart City Ambassador for Amsterdam Smart City and Chief Technology Office of Amsterdam, winners of iCapital 2016. This lecture is organized by HollandHub, a private-public initiative intended to support innovation in Ukraine with advanced market-proof technologies, services and knowledge created in the Netherlands. During this lecture the organizers of HollandHub together with Embassy of the Netherlands in Ukraine will introduce this initiative to general public. The lecture is aimed to inspire the citizens of Kyiv with the experience of Amsterdam. Innovation and change is a continuous strategic process. Anil will explain the drives for successful innovation on a city level. Frans-Anton will represent Smart City Amsterdam and it's strategic agenda, lessons learned and it's challenges. Anil will then elaborate on open innovation and key learnings around How to organise for result. The lecture is the first event organized by HollandHub. More lectures on Dutch urban and design best practices will follow at Projector. Stay connected! — Amsterdam's horizon of innovation. What is planned to make the city even a better place for the locals and tourists? This event will be interesting for general crowd who want to hear about the practices and process of urban innovation in Amsterdam.